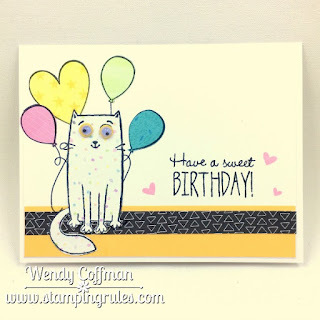 I am just in love with this sweet cat from the August Stamp of the Month. Isn't he sweet when paired with a bunch of balloons? I paired the SOTM kitty cat with Happy for You. I was working with the new sketch over at Freshly Made Sketches. I couldn't resist adding some Calypso into the mix. I'm also linking up over at Seize the Birthday! I had seen an adorable polka dot version of this cat bu Blythe Shupe on Instagram, so I knew I wanted to try paper piecing him. When I stamped out the guide for where I would place my pieces it was a big old mess. I crossed my fingers that I wasn't crazy and started gluing on the balloons. I love how it turned out in the end...sometimes you just gotta keep on going until things come together! I can't believe that today is the last day to adopt this sweet little cat for your very own. Check out the Going Soon section of my website so you won't miss out! Adorable card! Love the colours and love the paper piecing. Beautiful! This is adorable! Your polka dotted, googly-eyed cat is just the cutest! Thanks so much for joining us at Freshly Made Sketches. 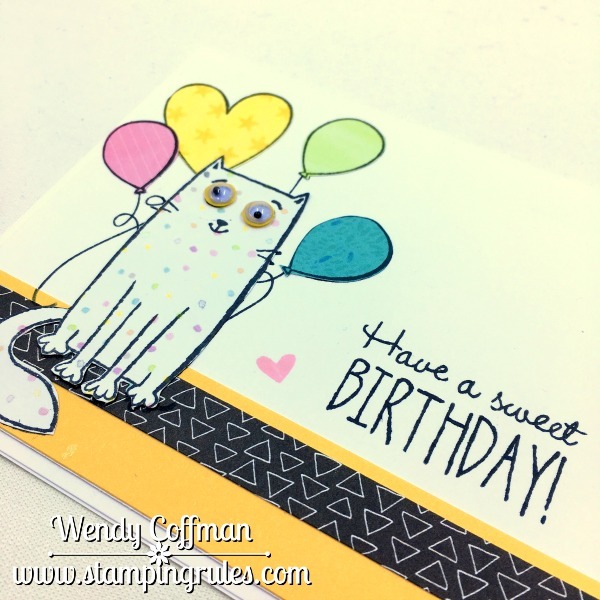 The cat is adorable surrounded by those wonderful shaped balloons! I love how you have him "grounded" and his googly eyes are so fun! Thank you so much for sharing this at Seize the Birthday with us! !